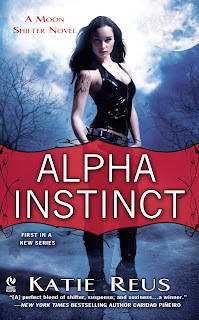 Alpha Instinct is the debut novel in the Moon Shifter series. It is an interesting blend of urban fantasy within a somewhat contemporary romance. Although Gikany and Una enjoyed it, there are some issues we hoped are simply “debut-itis” factors. Sometimes a novel will warm you up and slowly get you into the world and the “conflict.” This is not one of them; we begin with Ana facing off with the rival pack adjacent to hers. Alpha Instinct wastes no time in showing that pack politics are not all they are cracked up to be. Gikany and Una enjoyed the weight of politics and the war of perceptions and prejudices that seem to permeate the world that Ana lives in. The idea that there is a overall council that governs the pack is very interesting as it is balanced between the notion that a pack (and most importantly its alpha) must be able to protect their own. Going to the council for assistance is truly a double-edged sword – they may help you, but if in the process of helping you, they feel you are unable to be a pack, they will then assimilate you into other packs. The distrustful feelings that permeate the interactions between different established packs and between humans and packs add to the drama and mystery of who the “big bad” is. The “whodunit” aspect of the novel is gripping and was well woven into the overall pace of the novel. The reader ends up suspecting everyone, which keeps you on pins and needles until the very end. Two great examples of the overwhelming reality of prejudices are the relationship of Ana and Vivian and between Ana and Kaya and her son Matt. Ana is a wolf shifter and Vivian is a young jaguar cub. Ana treats Vivian as if she is her own child, not just one of the pack, which is an oddity. Since Vivian is a jaguar, the fear that Ana would reject her or worse, kill her for trespassing, forces Connor to keep her a secret from Ana. Combine this with the friendship Ana has with Kaya and Matt Dunlauex (two humans), and you can see Ana’s perceptions change. She didn’t realize that her friendship with the Dunlauxes was mutual, nor what the friendship would mean to her and her pack. Watching the development of Ana and Vivian’s close bond and the continued friendship between Kaya and Matt gives the foundation in the novel for the future books that will show this pack is one that wants to change the insufferable weight of prejudice in this world. We have enjoyed novels with more than one POV (point of view). However, you can have too many in one novel. Alpha Instinct is a prime example of a novel with way too many POVs. After much discussion, Gikany and Una feel that the enemy POVs were unnecessary and bogged the novel down. The information gleaned in them could have been conveyed in a different matter without changing POVs and slowing down the story. There were some instances that were just not necessary (for example, we have the POV of a big bad that dies…which made his previous POVs completely unnecessary – we don’t NEED to connect to him… he’s the bad dude, we won’t feel pity for him, not that he deserved any…creepy dude that he is). The “big bad” can be conveyed just fine through the eyes of our heroes and heroines. We do have four POVs of our good guys group and that was okay since two will be our “couple” in the next novel. Another issue is our lack of connection to the main couple. They had a previous attraction to each other and then Connor split…for no reason that Ana could see. We are just expected to accept that they are intended bondmates. But we never truly felt the connection between them. It was as if the preexisting relationship/interactions was the justification. But since we didn’t experience it, the relationship between the two main characters in the book was hollow. It seemed like a cheat to get out of having to develop the main characters and most importantly their connection to one another. As the reader, you just do not feel the emotional ties between them. The shapeshifter mythology was slightly lacking. We know they are packs, some of the natures of shifters, but we do not get any background or foundation on how the mythology is based or how it works. We just have to accept the dribs and drabs of information as they come to us. It’s shallow and somewhat vague. Perhaps in the next novel, more of the nature and mythology will come to light. Plus we have a stronger connection to the couple in the next book because we have watched them meet and interact in this book. The foundation is laid and we cannot wait to see what transpires between Liam and December. All in all, this is an enjoyable read but it did lack the depth and convictions that the foundation a more polished novel would accomplish. The transitions between scenes were a little jumpy, due in large part to having too many POVs. We had stronger connections to the supporting characters than the main characters. But all that withstanding, Gikany and Una look forward to reading Primal Possession due out later this year and recommend you pick up Alpha Instinct. It is enjoyable, don’t get us wrong, but the foundation has truly been laid for the next book and we are REALLY eager for it. Sometimes with series the first book is a set up and that is the feel we got from this book. Did we enjoy reading it, yes, but it left us drooling for the next book.